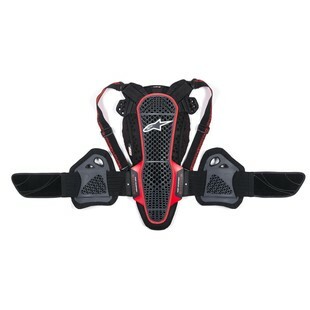 Alpinestars, a company often on the forefront of motorsport safety evolution, has just released a new stand alone-back protector and we think it is worth a closer look. The CE Level 2 rated Alpinestars Nucleon KR-3 Back Protector, while similar to their other stand alone-back protectors, has received several upgrades and some new features that make it a marked improvement. First off, the KR-3 is using a new and improved impact absorbent PU Viscoelastic foam, which should be an upgrade over the original Nucleon material. The hard lattice shell has also been redesigned and improved. One of the standout features of this new piece is the pair of hard side body protectors located on the waist strap, lending coverage to an area that most other back protectors fail to address. Also worth noting are armor extensions that will help protect your shoulder blades. This fully adjustable piece also accepts the KR-C chest armor and the KR-T tailbone armor. With the new features and improved materials, this new stand alone back protector is going to a home run and should work for nearly any riding style out there.